It's been a hot second since I've done a round-up of some of my favorite Instagram posts! While I haven't had the time to sit down and write out a post (or shoot a look outside with my camera) it is super easy for me to snap an outfit of the day, or #ootd, on my way out the door. I've pretty much got the pose down... perhaps I should try and switch that up haha. When I get in a creative rut (with blogging) I always start by trying to get clever with my work wardrobe aka my everyday wear. I'll try combining a necklace with a skirt I never wear anymore or belt a dress that I wear loose and flowy. Funny how taking a good mirror selfie tend to make everything seem to fall into place. I'm going to stop making excuses for why I can't blog or shoot on the weekends... I have TONS of travel coming up (would y'all want a post on my upcoming trips?) so I'm hoping to get lots of content shot. AND my home tour is almost complete - because I'm finally feeling 100% about things a year later #designerprobs. Shop some of my recent IG outfits below! If something is sold out I've attempted to link a similar item! Make sure to follow me on Instagram to be up to date with everything! This suitcase is the 21" size. Dress is hi-lo hem and has a long tie in the back so you can adjust where it sits on you in the front. 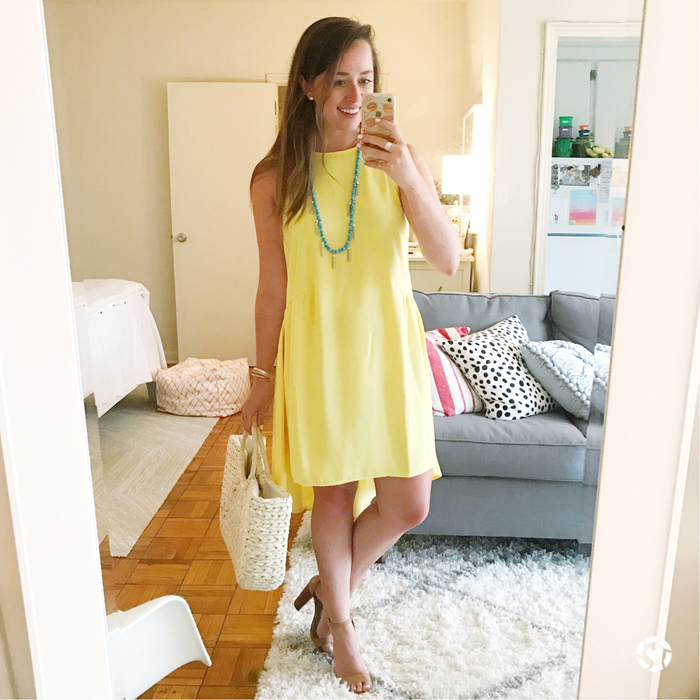 This dress is an old Topshop find but I linked this season's version of the dress. I belted it to give it more shape! Embroidery is all the rage this summer so when I pulled this old dress from the back of my closet I knew it would cheer me up on a rough morning. Lipstick is NARS "heat wave". I own this dress in two colors (olive green and blue) and wear it all the time. This necklace has also been on repeat - I bought it for my birthday (you get one item 50% off during your bday month)! Yes, I love tassels... that's no secret. These have to be the classiest (aka dressiest) ones that I own!! Hello, winter cocktail parties! Lipstick is Bite in shade "palomino". My new fave tank of the summer - the perfect length to wear with shorts, double lined, and the straps have the cutest detailing to them! I own it in white and blue and am wearing a size 6. Shorts are old from the Lilly x Target collaboration. I can't say enough good things about rompers. It's pretty much all I wear on the weekends. This white one is sold out (I'll still link it in case it randomly pops back up) but I'm also linking to some cute white rompers I have my eye on right now... you can never have too many! I bought this kimono as a beach coverup but am so in love with it that I pair it with "regular" clothes too - most recently this black dress and a white tank with white jeans! One of my recent finds was this $25 romper! I wore it on the Fourth of July - perfect for roasting s'mores by the fire :) I've also included the black strapless romper I found in the same trip. Thanks for reading along - did you see anything you have to have ASAP?! I LOVE these types of posts - and you definitely have nailed getting the perfect mirror OOTD shot!